Rep. Alexandria Ocasio-Cortez and a top aide appear to control an outside PAC credited with being the central force behind her June 2018 primary victory. 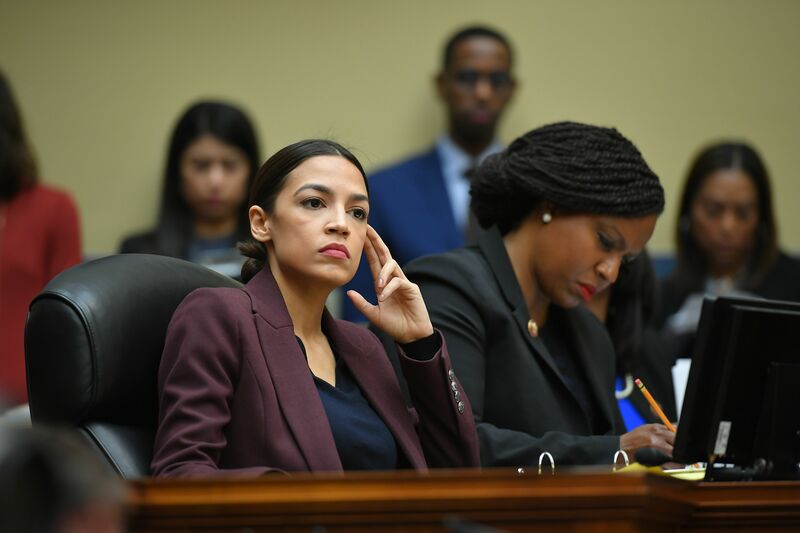 One former Federal Election Commission member thinks there would be a “serious investigation” if a complaint were filed, noting that the probe could potentially result in civil penalties or even jail time for Ocasio-Cortez and her chief of staff. Justice Democrats ran campaigns for Ocasio-Cortez and 11 other Democrats, but the New York Democrat was the only one to win her general election. Democratic Rep. Alexandria Ocasio-Cortez and her chief of staff Saikat Chakrabarti obtained majority control of Justice Democrats PAC in December 2017, according to archived copies of the group’s website, and the two appear to retain their control of the group, according to corporate filings obtained by The Daily Caller News Foundation. If the Federal Election Commission (FEC) finds that the New York Democrat’s campaign operated in affiliation with the PAC, which had raised more than $1.8 million before her June 2018 primary, it would open them up to “massive reporting violations, probably at least some illegal contribution violations exceeding the lawful limits,” former FEC commissioner Brad Smith said. “If the facts as alleged are true, and a candidate had control over a PAC that was working to get that candidate elected, then that candidate is potentially in very big trouble and may have engaged in multiple violations of federal campaign finance law, including receiving excessive contributions,” former Republican FEC commissioner Hans von Spakovsky told The Daily Caller News Foundation. And fellow former FEC commissioner Brad Smith told TheDCNF that if “a complaint were filed, I would think it would trigger a serious investigation.” He also noted that such a probe could potentially result in jail time for Ocasio-Cortez and her chief of staff, Chakrabarti. Ocasio-Cortez and Chakrabarti could face prison if the FEC determines that they knowingly and willfully withheld their ties between the campaign and the political action committee from the FEC to bypass campaign contribution limits, according to Smith. 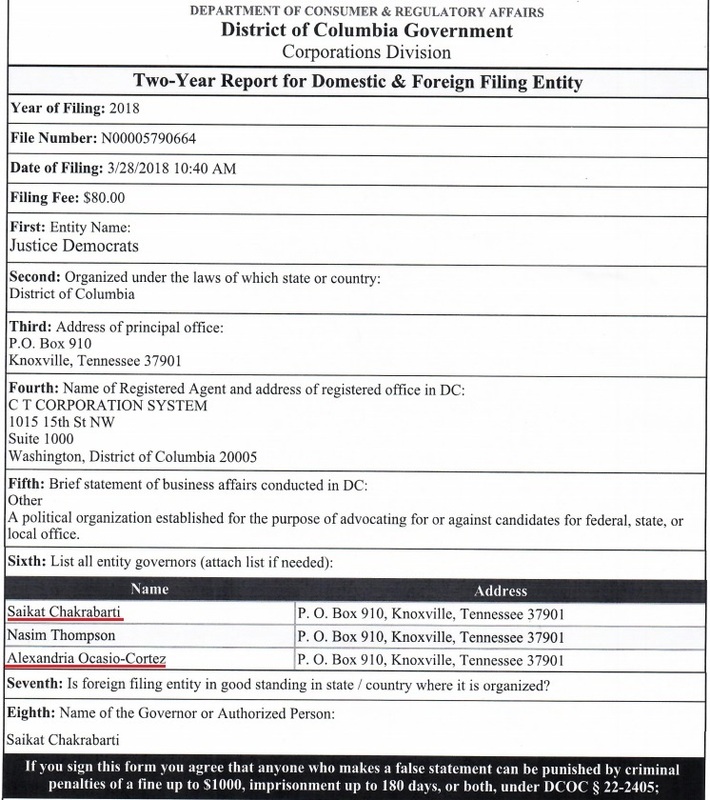 Justice Democrats stated on its website from December 2017 until two weeks after Ocasio-Cortez’s June 2018 primary victory that she and Chakrabarti held “legal control” of the PAC, and corporate filings obtained by TheDCNF show that the two still serve on the three-member board of Justice Democrats on paper. Political committees are affiliated if they are “established, financed, maintained or controlled by … the same person or group of persons,” federal election law states. And if the FEC concludes that Ocasio-Cortez’s campaign and Justice Democrats were operating as affiliated committees, “then anyone who contributed over $2,700 total to her campaign and the PAC would have made an excessive contribution,” which is a campaign finance violation, Smith told TheDCNF. Ocasio-Cortez’s campaign and Justice Democrats raised a combined $4.6 million during the 2018 midterm election cycle, FEC records show. There’s a maximum five-year prison sentence for anyone who knowingly and willfully receives a collective $25,000 or more in excessive campaign contributions in a single calendar year. Justice Democrats raked in far more than $25,000 from individual contributors of over $2,700 after Ocasio-Cortez and Chakrabarti took control, according to FEC records. Justice Democrats supported Ocasio-Cortez throughout her entire primary run. The group, which Ocasio-Cortez and Chakrabarti appear to have legally controlled for much of her campaign, had raised more than $1.8 million by the time she ousted incumbent Democrat Joe Crowley. Ocasio-Cortez was the only Justice Democrats-sponsored candidate to win her general election. She was also the only Justice Democrats-sponsored candidate to hold legal control of the PAC. The other 11 candidates propped up by Justice Democrats lost their respective races, according to The New York Times. Justice Democrats staffers said there were discussions to go all in for Ocasio-Cortez as early as June 2017. Last year, when @_waleedshahid and I were at @justicedems, we lead a process to name our 2018 goals. Goal number 1: to defeat at least one prominent establishment Democrat with a JD recruited candidate. Everyone agreed @Ocasio2018 was our best shot. Justice Democrats’ goal was for one of its sponsored candidates to defeat the incumbent, co-founder Corbin Trent told The Washington Post in June 2018, and former Justice Democrats staffer Max Berger tweeted that they established that goal in 2017. But the PAC was advertising that it sought to replace numerous Democratic members of Congress with progressives. Ocasio-Cortez and Chakrabarti, who served in multiple leadership roles within her campaign including campaign manager, were serving on the board of the Justice Democrats as early as Dec. 2, 2017, according to an archived copy of the PAC’s website. Cenk Uygur and Kyle Kulinski of The Young Turks network were also on PAC’s board in early December 2017, but Uygur was forced out of the organization Dec. 22, 2017, after what Chakrabarti called “extremely disturbing sexist and racist statements” Uygur made in the early 2000s were unearthed. Board members Ocasio-Cortez and Chakrabarti were left in control over Justice Democrats after Uygur and Kulinski’s departures, according to an archived version of its website saved on March 23, 2018, by the Internet Archive’s Wayback Machine. “Justice Democrats PAC has a board consisting of Alexandria Ocasio-Cortez and Saikat Chakrabarti that has legal control over the entity,” the Justice Democrats website read that day. Justice Democrats then reported that Ocasio-Cortez and Chakrabarti were “governors” of the organization in a document submitted to the Washington, D.C. Department of Consumer & Regulatory Affairs on March 28, 2018. A third listed governor was the PAC’s treasurer, Nasim Thompson. A governor of an organization incorporated in D.C. is any person “under whose authority the powers of an entity are exercised and under whose direction the activities and affairs of the entity are managed,” according to the D.C. Law Library. The Justice Democrats’ website continued to state that Ocasio-Cortez and Chakrabarti held “legal control over the entity” for weeks after Ocasio-Cortez’s shock primary victory over Crowley on June 26, according to a July 10, 2018 archive of its website. The Justice Democrats’ website currently states that Alexandra Rojas and Thompson hold legal control of the organization, but the PAC hasn’t filed documents to Washington, D.C. where it’s incorporated reflecting the change, meaning that Ocasio-Cortez and Chakrabarti currently retain majority control of Justice Democrats on paper. Politico reported Jan. 16 that Chakrabarti resigned from the board, and Justice Democrat’s website no longer listed Ocasio-Cortez as a board member as of Aug. 8, 2018. TheDCNF received the corporation filing document still showing both as governors on Feb. 25. The D.C. government website showed the same as of Monday afternoon. Ocasio-Cortez’s office and Justice Democrats did not respond to multiple requests for comment.